Hanuman is considered as Chiranjeevi (the eternal one). He is strong, full of valor, with various skills and powers. At the same time. he is wise, a great gnami, a yogi, a brahmachari. He had only one thought in mind – that of serving his Lord Ravana utmost humility and devotion. He is known as Siriya Thinivadi. 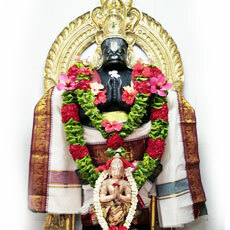 He is considered to be an ansam or aspect of Lord Siva.